Make a plan for your home. This is the first step in the organizing process. Use a spiral notebook to capture thoughts, ideas, and solutions for each room in your home. Assess the causes of the disorder so that lasting change can be achieved. Walk through your home to discover how one room affects another. Rooms in a home must work together for an organizing system to be effective. What do you call this space? What activities will take place in this space? Do you have all of the items you need to support those activities? What are you dreaming of? What does the finished space look like to you? What is your definition of “organized”? 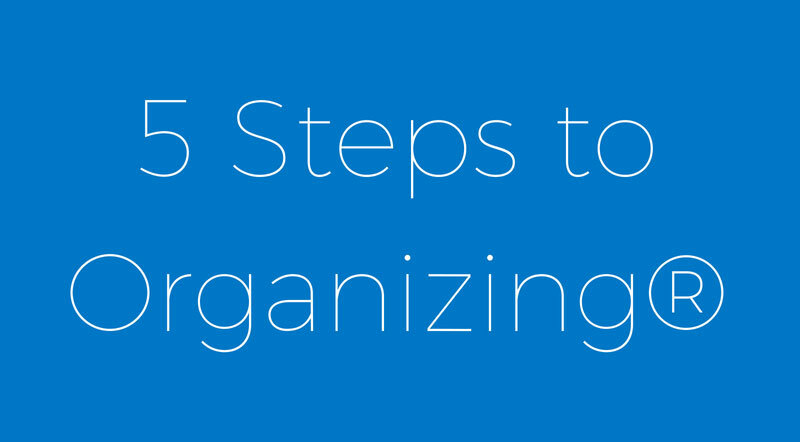 Realize that organizing is not an overnight process. Commit a day to empty the room of its contents, clean and evaluate the space. Put like items together (grouping). Relocate or let go of (donate, sell, trash) anything that doesn’t pertain to the room’s function and purpose. Reduce and let go of (donate, sell, trash) what doesn’t serve a purpose in your life TODAY. Assign a specific purpose for each room in your home. This may sound simple, but things become nomadic when there is not a predetermined place to store them. Knowing the function of each room in your home eliminates the constant decision-making process of putting things away. Evaluate the desired activities for each room in your home and plan to store the items that support those activities nearby. Creating a specific zone in the space for each activity. Place only the items needed to support each activity in their appropriate zone. Place the items you need to access frequently in “prime real estate” spaces and items you don’t need to access frequently in the other spaces. Measure the items to be contained? Organizing is an on-going process. As our lives change so do our organizing needs. It is imperative to reassess the rooms in your home on a regular basis and make changes when necessary. Organized is not neatness. In my experience, stress does not come from clutter; it comes from not knowing where to put the clutter away. My home gets messy as my family, and I go about living. The difference that organizing makes is that I know where to put the mess away and can have it cleaned up in a short amount of time, without resorting to the shove and close method. That gives me peace of mind. Is the space now as you envisioned in Step 1? Can you maintain it on a regular basis? What will that maintenance plan be?